Never pick up the wrong specs again! Coming out of the opticians with FOUR pairs of glasses, I could see an immediate problem. Which glasses were which? Were the ones in the blue case for music or reading? Which pair should live in the car? The only ones I could identify with any confidence were the prescription sunglasses. No problem, I thought – there’s bound to be a case featuring a treble clef (although alto might be a bit optimistic) in the music shop. But there wasn’t. I scoured the internet, Ebay, Amazon etc – didn’t find many specs cases at all, and none which helped in any way to identify what the glasses inside were for. So we designed our own, and here they are. 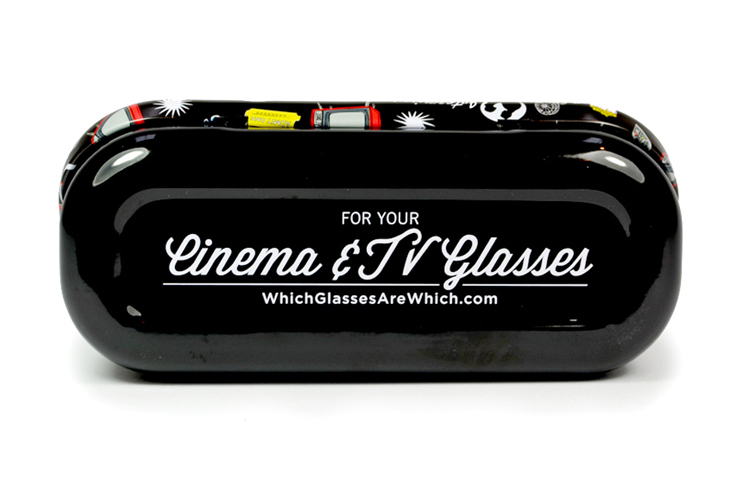 I knew I wasn’t alone after spotting a friend’s case with “music glasses” sellotaped to the lid – so these designs are for everyone who has ever wondered “which glasses are which”! Hope you like them and find them useful. They make fab gifts for grandad and granny, teachers, crossword solvers, cinema buffs, sewing & knitting fans and hard-to-buy-for men! 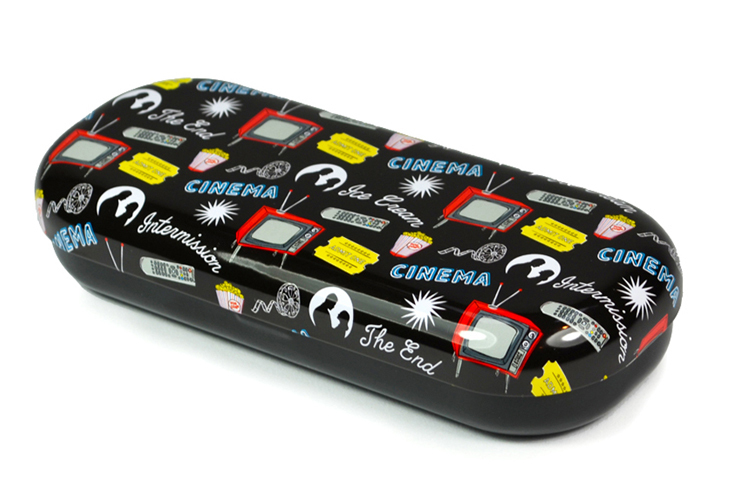 December 2018 - music glasses cases are now sold out. 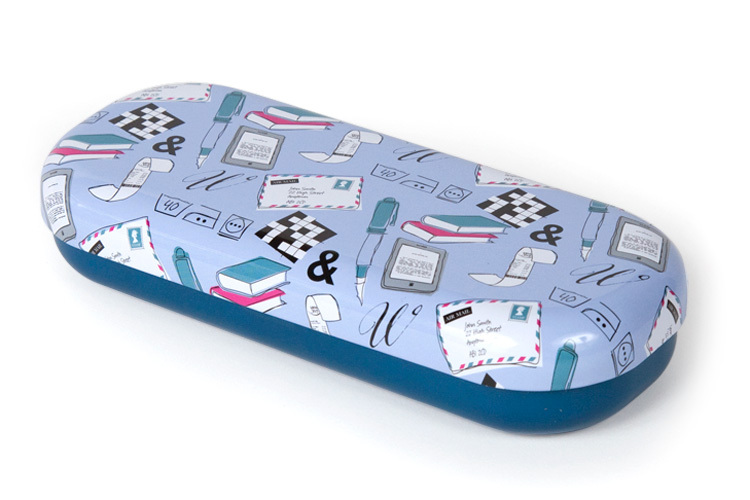 PS We also make personalised cloths for our glasses cases – please visit our Not On The High Street store or Etsy to order. 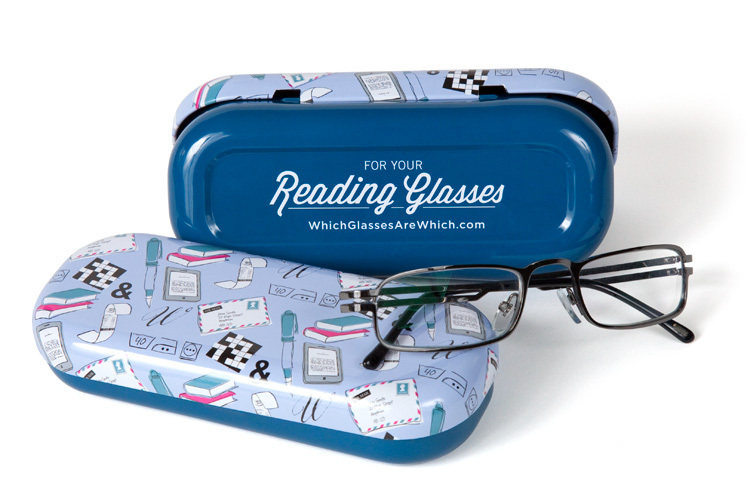 Books, newspapers, mobile phones, washing instructions, sell-by dates, the crossword… everything seems to have shrunk, so for all of us who need reading glasses, here is the perfect case to keep them in. 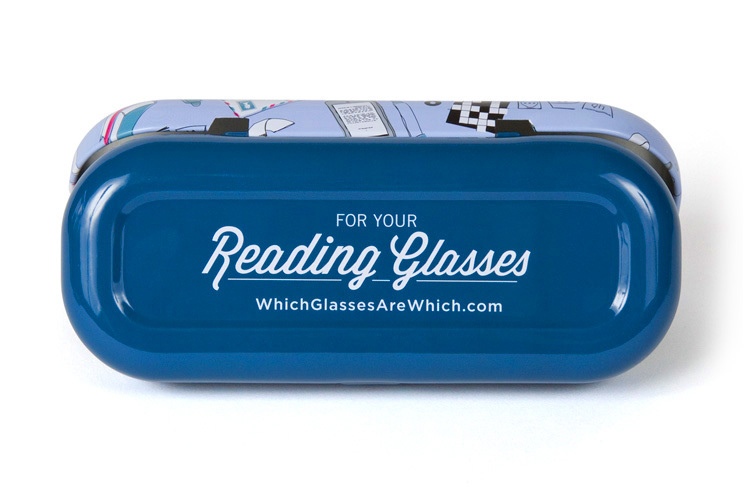 Makes a brilliant gift for anyone who mislays their specs, especially bookworms and crossword puzzlers. Lacquered design on a sturdy hinged tin case with flock protective lining, approx. 16 x 6.5 x 3cm. 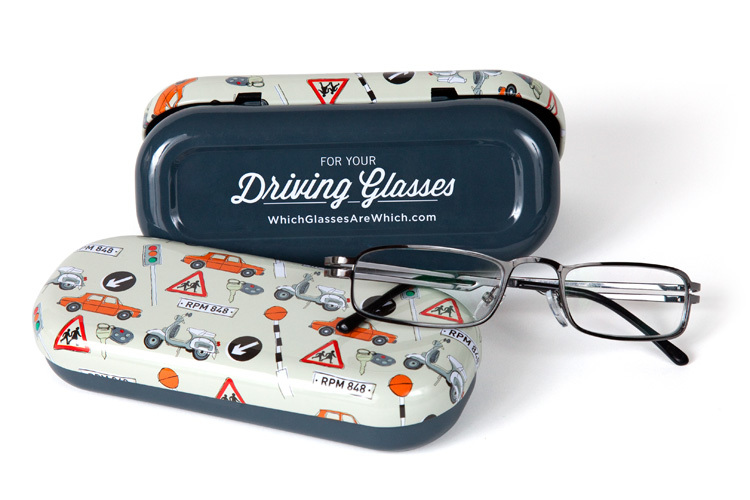 Many people need glasses for driving, so this retro styled case offers a safe home for them whether they live in the glove compartment or your bag. No need to spend ages fishing around for the right glasses – here they are! Great little gift or stocking filler for friends and relations – especially hard-to-buy-for men. 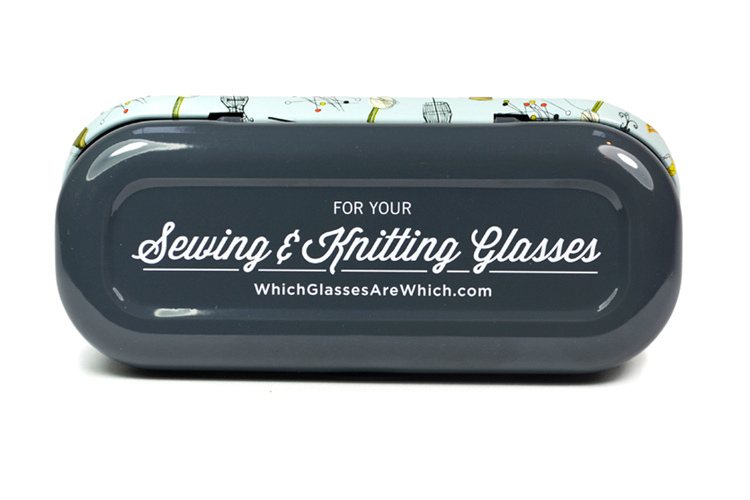 For everyone who loves to knit or sew (and needs to locate their specs! 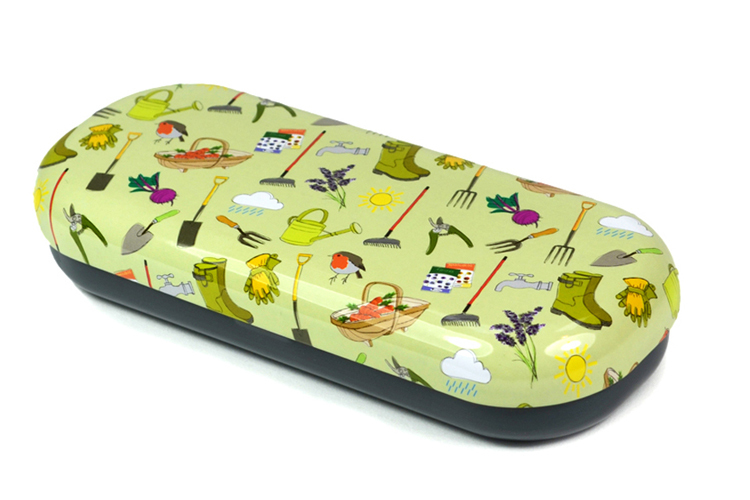 ), this pretty case makes a perfect, thoughtful gift. Charming illustrations feature knitting needles, buttons, scissors, pins and a wonderfully retro dressmaker's dummy on a cool eau-de-nil background. 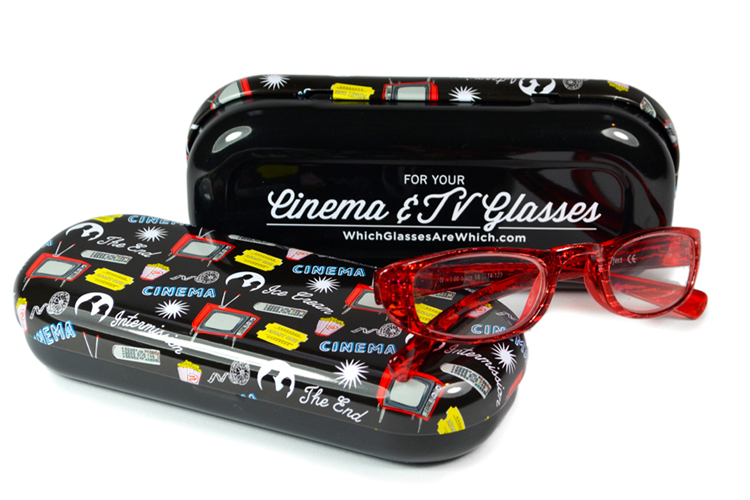 Specially designed for everyone who uses distance glasses to watch TV and films, the witty illustrations feature a selection of movie and telly related icons with a distinctive retro flavour. 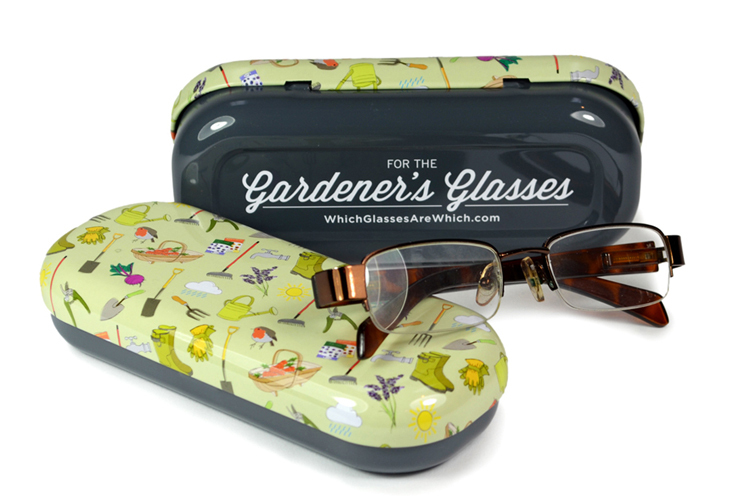 Charming, original illustrations depict many things close to a gardener’s heart including flowers, veg, tools, wellies, a robin and some weather, while the back of the case reads “For the Gardener‘s Glasses”. 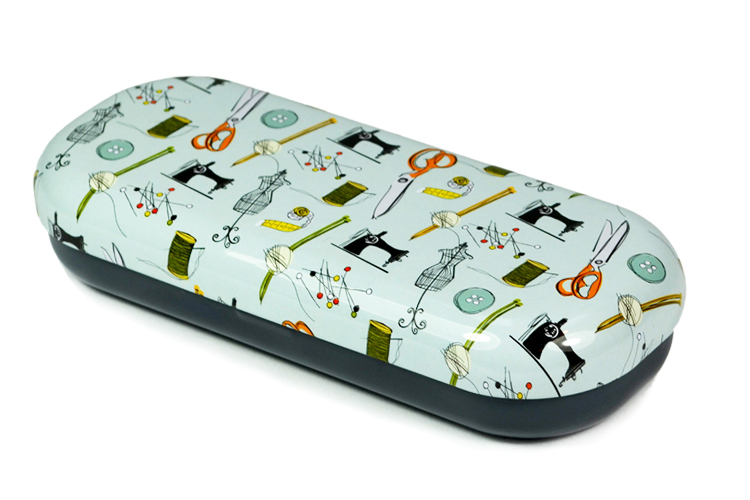 "Glasses are somewhat of an issue in this household so I have to say my husband was delighted with this case. Very good product and a clever idea!" 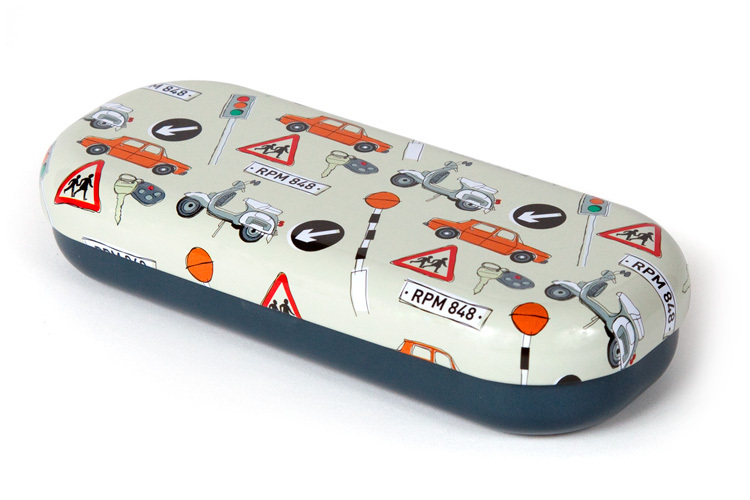 "I love my specs cases. Very strong. Very elegant. And, best of all, they are colour-coded so I can find the right one even when I'm not wearing my glasses!" "What a brilliantly simple idea." 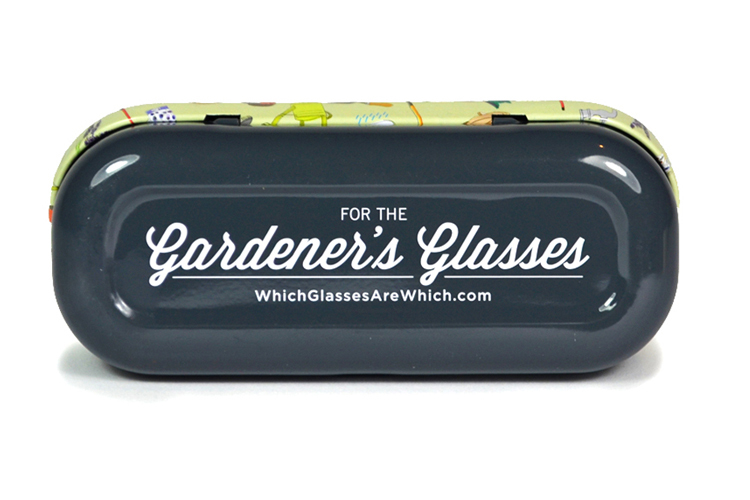 "Great idea and even if you only have reading glasses, the cases make great gifts. 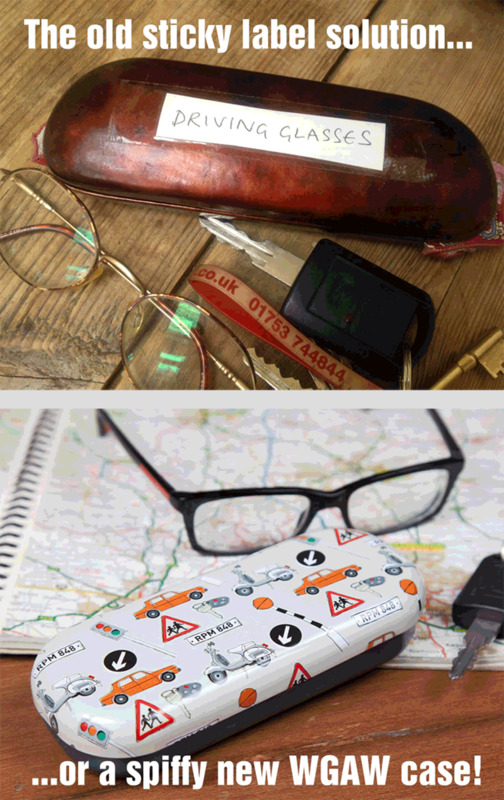 I need a pair of reading glasses in the car to read atlas, text messages etc so the road sign case would sit nicely in the car." "Absolutely brilliant idea, I am forever getting into the car with the wrong ones on, mixing them up or losing them. Love the pictures on the cases too!" "Fun design and good quality case. Quick delivery time." "I bought this a present for my crossword fanatic friend but I'll probably get myself one as well. Very nicely made." "Great idea … and love the print! They make excellent gifts!" "Has been very useful so far, still getting used to the idea of carrying a metal (albeit a lined one) tin around with my glasses!" "Such a great idea, mine get mixed up in my bag, can never tell the difference." 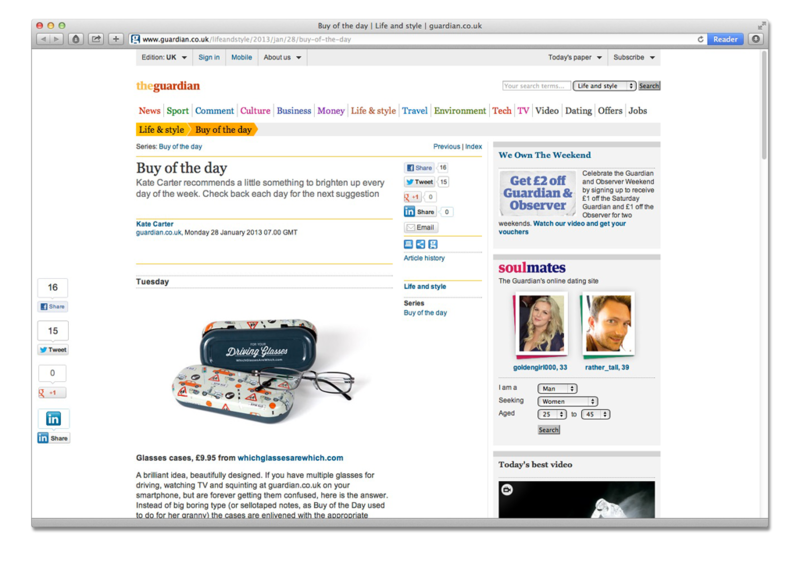 We were thrilled to be featured as Kate Carter's Buy of the Day in The Guardian. "A brilliant idea, beautifully designed. 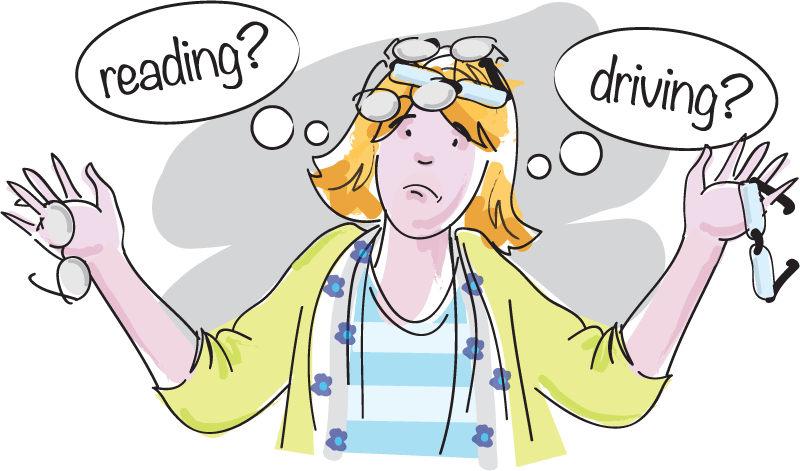 If you have multiple glasses for driving, watching TV and squinting at guardian.co.uk on your smartphone, but are forever getting them confused, here is the answer. Instead of big boring type (or sellotaped notes, as Buy of the Day used to do for her granny) the cases are enlivened with the appropriate image. Crosswords, pens and letters for the reading case, for instance. But even if you just need a new case, these are ace. Buy of the Day particularly likes the music-themed one." 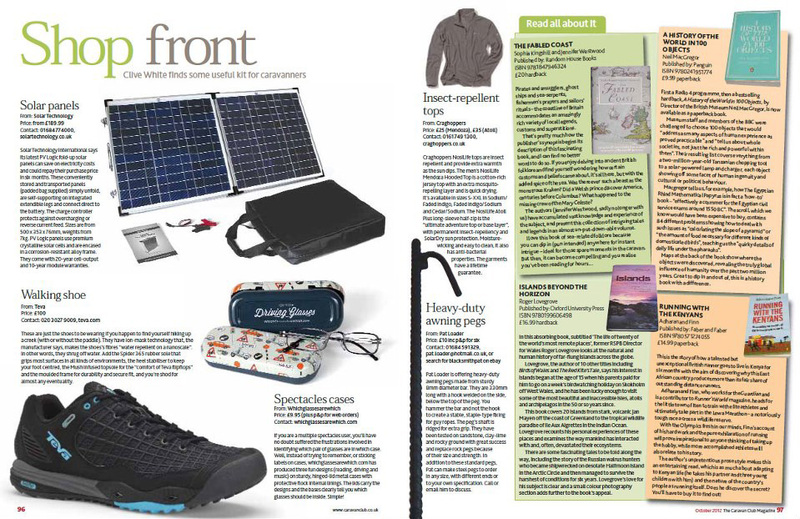 The Caravan Club picked us as a featured product in their October edition, and lots of people have ordered. Thank you so much! 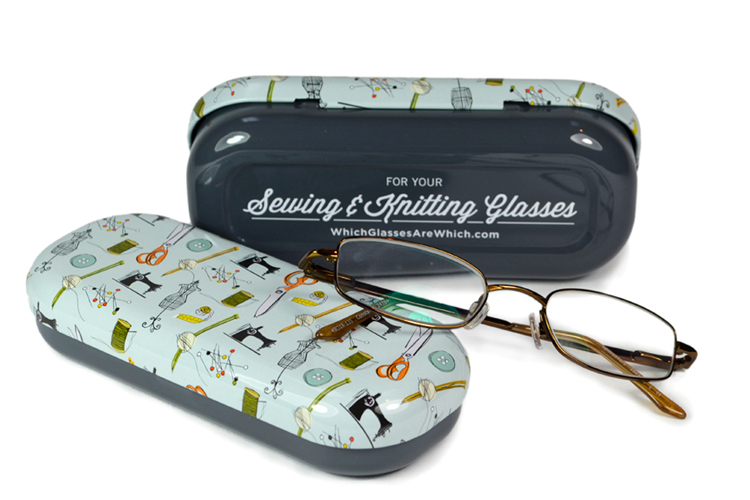 As well as directly from us via this website, you can buy WGAW from our stores at Not On The High Street and Etsy where we also offer the cases with personalised glasses cleaning cloths. If your shop or gallery would like to stock WGAW cases, we'd love to hear from you. 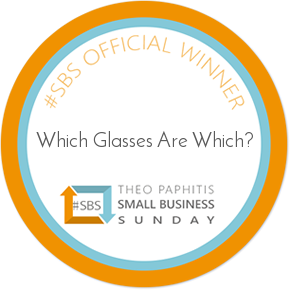 Drop us an email to hello@whichglassesarewhich.com, or give us a call on 0118 940 3663. We pack our products securely in specially made boxes and deliver via Royal Mail. Orders are usually despatched within 3 days. Delivery in the UK is free, but if you need faster delivery we can organise a next day courier at extra cost – please email us to enquire. If you'd like costs for delivery outside the UK, please email us with the delivery address, how many cases you'd be ordering and how quickly you need delivery. We trust that you will enjoy your purchase from us, but in the event that your item arrives damaged, defective or not as described, please notify us straight away by emailing hello@whichglassesarewhich.com and return the item to us at Lawrence Beavan Ltd, 11 Waltham Road, Twyford RG10 9EB using a “signed for” method of delivery and proof of postage, within 14 days of receipt. Please provide an email address so we can acknowledge receipt. To be eligible for a refund, you must return your item in the same condition you received it, with all packaging intact, and the return must be postmarked within one week of receipt. We will send you an email acknowledgement of returned items and refund your purchase cost, in the same form of payment originally used for purchase, within 30 days of receiving your return. If you are returning an item because of an error on our part or, in accordance with our returns policy, because it is damaged or defective, we will refund the delivery charges incurred in sending the item to you and pay your costs of returning it to us via Royal Mail. Please obtain a receipt of delivery to secure a refund for your delivery costs. If an item is returned as damaged, defective or incorrect we will check on receipt. If we find no fault, we reserve the right to re-charge you for the item(s) and to recover our fees and expenses from you. If you’ve got a query relating to sales or something more specific, drop us an email to the address below*. 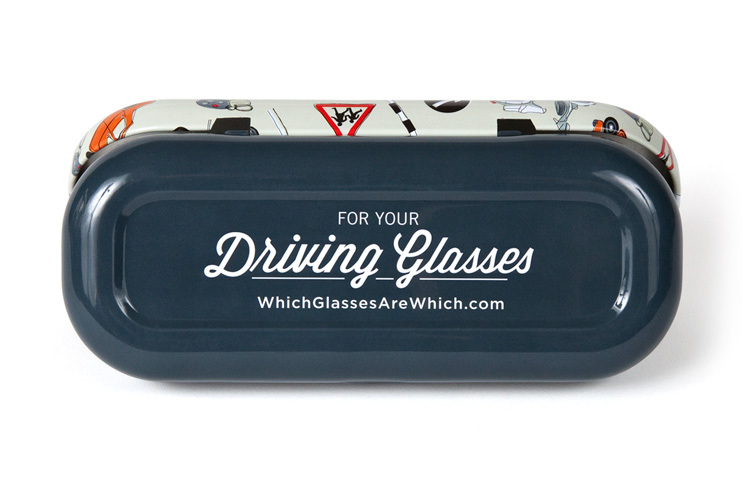 *Unfortunately we cannot tell you which glasses are which, that’s what the cases are for!